RED Electrical - Slash your electricity bills with the new TIDE tariff from Green Energy UK - even WITHOUT solar panels! News > News about us > Slash your electricity bills with the new TIDE tariff from Green Energy UK – even WITHOUT solar panels! The new TIDE electricity tariff from Green Energy UK could cut your electricity bill by hundreds of pounds. When you sign up for the TIDE tariff, Green Energy UK will arrange to fit a smart meter to your home, free of charge. This allows you to take advantage of their time-of-use tariff, which has four charging periods per day, starting at just 4.99p per unit of electricity. Multi-rate tariffs are common for businesses and industry, but now domestic customers can take advantage of them too. All the rates are in the table opposite. You are probably wondering how can this save you money when the peak rate is 5 times higher than the headline-grabbing rate. The answer is that you need to ensure that your electricity usage occurs during the cheapest charging rate. Firstly, energy-hungry appliances such as your washing machine and dishwasher can be timed to come on during the 4.99p charging period. Secondly, you could install a battery storage system to ‘time-shift’ your usage so that you don’t use electricity during the expensive part of the day. 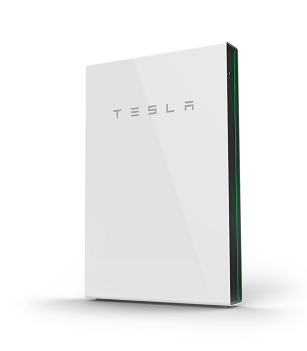 Powerwall 2 can store up to 13.5 units of electricity in its lithium ion cells. It can charge itself up overnight while the electricity price is very low, then strategically release the stored electricity when the price is higher, preventing you from using the more expensive rate of electricity. It will do this every day of the year, saving you money on your electricity bill. Even without solar panels. Of course, if you do have solar panels you can also be charging Powerwall 2 for free during the day.